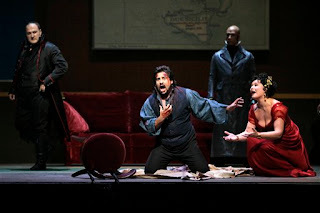 A Liberal's Libretto: Tenor Alvarez: Met's new Tosca is like a ... car wreck. Tenor Alvarez: Met's new Tosca is like a ... car wreck. Associate Press writer Ronald Blum reports that Marcelo Alvarez, who sings Mario Cavaradossi in the MET's new Luc Bondy production of Tosca, likens parts of the controversial new production to a car wreck. "It's like there's an accident in the middle of street: People say, `Ah, I don't want to go.' But they want to see the blood," the tenor said. It's no joke. I have a feeling that Peter Gelb didn't exactly get the warm-fuzzies when he got wind of this.